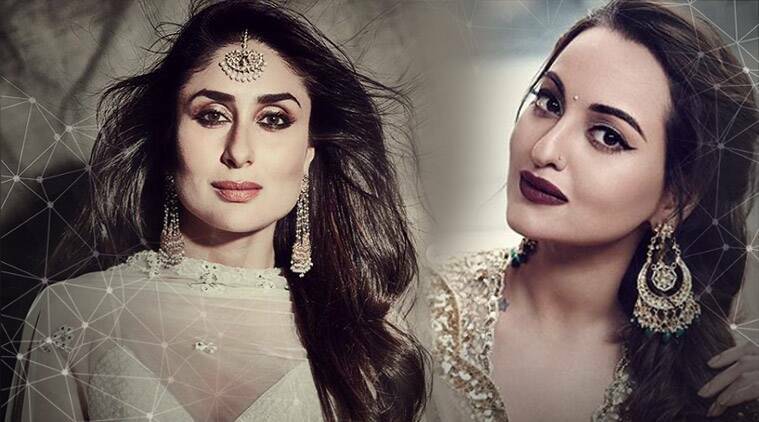 Kareena Kapoor Khan or Sonakshi Sinha: Who wore this Manish Malhotra sari better? At the Akash Ambani-Shloka Mehta reception party, Sonakshi Sinha wore a sheer sari with crystal work by Manish Malhotra. The sari was paired with a matching shimmer blouse, and styled with a silver bag, a choker and hair worn in cascading curls. The grand wedding over the weekend saw almost the entire Bollywood in attendance in their ethnic best. Akash Ambani and Shloka Mehta recently tied the knot, and as expected, the grand wedding saw almost all of Bollywood in attendance dressed in all their finery. The pictures from the three-day wedding celebrations have gone viral on social media too. But what caught our undivided attention is how designer Manish Malhotra re-used his seven-year-old creation. At the reception party, actor Sonakshi Sinha wore a sheer sari with crystal work by Malhotra. The sari was paired with a matching sleeveless shimmer blouse, and accesorised with a silver bag, a choker. The Lootera star wore her long hair in cascading curls. Sinha’s look reminded us of 2012 Filmfare awards, where Kareena Kapoor Khan was spotted wearing a similar sari by the designer. The Jab We Met actor, had however, teamed it with a simple long-sleeved blouse and had ditched jewellery. Other celebrities who attended the Ambani wedding over the weekend also included Deepika Padukone and Kareena Kapoor Khan – and each looked as gorgeous as the other. Styled by Tanya Ghavri, the Khan was also seen in a Manish Malhotra ensemble. The heavily embroidered outfit was accessorised with a statement neck-piece. The look was rounded out with hair tied at the back. We, however, think the overall look failed to impress. Styled by Shaleena Nathani, the Piku actor looked gorgeous in a sari by Sabyasachi. The look was rounded out with winged eyeliner and accessorised with a choker and earrings. The actor looked every bit like royalty. What do you think about the looks?